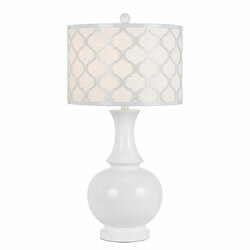 A Moroccan inspired twist, the Casablanca table lamp features a laser cut shade in an exotic pattern with a high gloss white finish over a sheer white fabric drum. The white resin base creates a cohesive look that is both luxurious and dramatic. No two are alike.